The notes of this bank are among the more common of the Private banks' notes, and they turn up frequently. Two variants of the 1 Guinea note are known with different designs and partnership listings. Images attached. I have not seen the later type for the £1 notes. Below is a Post Bill for Four Pounds. A Three Pound note from Ffrench's Dublin bank. Here is a 25 shillings note of the second design type, dated 10th February 1814. Two designs have also been observed for Ffrench's Bank Dublin 30 Shillings notes, examples attached. The later design has a vignette of a female figure, probably Cerus, Roman Goddess of the Harvest. I have noticed a third type for the Ffrench’s Bank Dublin 30 Shilling notes. This has the vignette of a female figure and the Hon. Martin Ffrench no longer listed as partner. This type is also associated with a change of address for the Bank (now No.13). In 1814 the Post Office renumbered the Ormond Quay addresses and No.12 became No. 13. The address change transpired to be an unlucky one. On June 27th, the bank stopped payment and a commission of bankruptcy followed. On December 9th, 1814, Lord Ffrench committed suicide, in despair over the bank's failure. The female figure is quite different in the third type. All other aspects of the note appear to be similar to the earlier type, apart from the removal of the partner. I'm not sure I would put my money into a bank located at No.13! 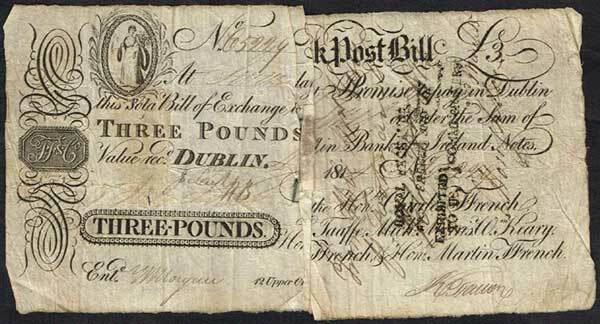 Bank post bills were issued by many banks in Ireland in the early 1800’s and became a significant element of circulating currency. Bank Post Bills were designed to transmit money through the post and were payable after a specified amount of time for security reasons. The design of the Ffrench’s Bank Post Bills is very similar to those of their banknotes and as such they are highly collectable. As for the 30 shillings notes, three types of £3 Post Bill have been observed for Ffrench’s Bank Dublin, examples attached. The early type appears to be quite scarce. That's a nice run of 3 Pounders! I treat these post bills as currency bills and collect them both equally. Yes, I think it is reasonable to consider them as currency bills given that they circulated as such when they were issued. To add to the variety, here is a Ffrench's Bank £3 note of the first design type. That is a nice example even with the mounting stickies. Has anyone catologed these varieties yet, or is it in progress: here? Paper Money of Ireland has catalogued a number of types based on different partnership listings. The existence of two design types add an additional layer of variety to the Ffrench's Bank notes. I plan to post the types that I have observed to date on The Forum. Three types of 3 Guinea Post Bill have also been observed for Ffrench’s Bank Dublin, examples attached. These notes frequently turn up for sale and are a good choice for collectors seeking an example of a note from the Irish Private Banking Era. Here is a second type of £4 Bank Post Bill which is issued by the final partnership. An interesting feature is the piece of paper with name of Bridget Magill attached by waxed seal. This most likely relates to procedures associated with the bankruptcy. It is likely that other types of £4 note were issued by this bank. Higher denomination notes and post bills of Ffrench's Bank appear to be scarce or even rare. Two types of 4 Guinea Post Bill are attached. I have not seen many notes of this denomination. Here is a £5 Post Bill of the earlier type issued in 1813. Other types of £5 post bills and notes were probably issued but are likely to be scarce. Here is a £10 note of the earlier type issued in 1813. The issue rates of these high denomination notes were low so this is likely to be a rare note. Here is a rare unissued £10 note with Thomas Ffrench as lead partner. The Dublin Branch is reported to have opened in 1807 so this note probably dates from 1807-1808. An interesting feature is the watermark, which reads ‘FOR THE HON. SIR THOMAS FFRENCH BART.’ and the address is given as 31 Dominick Street. That £10 is a nice example of a note. It is not often that the watermark can be seen clearly on these, and a refreshing reminder that the notes did contain good security features.